We’ve just come back from Dovedale. Dovedale? Yes, it’s in the Peak District, a glorious area of England, part of its Pennine spine. 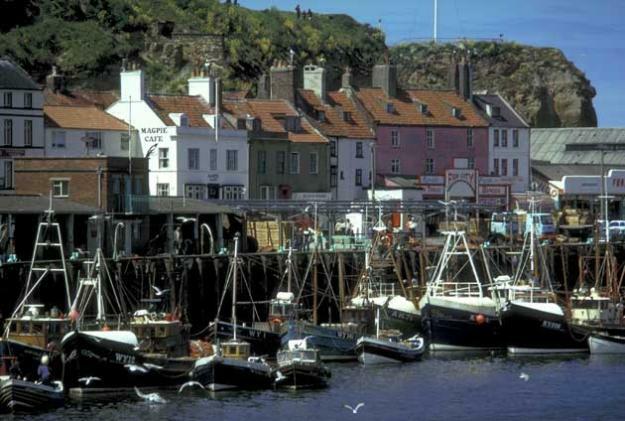 There are old stone-built towns and villages with long histories of hard work in mining, textiles and farming. There are limestone and millstone grit uplands and escarpments, with distant forest and moorland views, and valleys and gorges cut deep into the limestone. There are ancient stone circles and enchanting landscapes. Forget modern life, put on your walking boots and explore. We had four wonderful days, which for once, we didn’t have to organise. Here’s why. Walking with our group, as the afternoon sun cast our shadows against a drystone wall. Autumn was begining to show its colours, but summer temperatures remained. We walked. I didn’t have a camera (Barcelona…..). I had a new mobile phone though. It isn’t the same, but I played with some of its gizmos. Here are my postcards from Dovedale. Thorpe Cloud. It’s a tough triangular hill, formed of marine skeletons which haven’t easily eroded. The Nine Ladies, a Bronze Age standing circle. This fly agaric was an early victim of special effects on my phone. 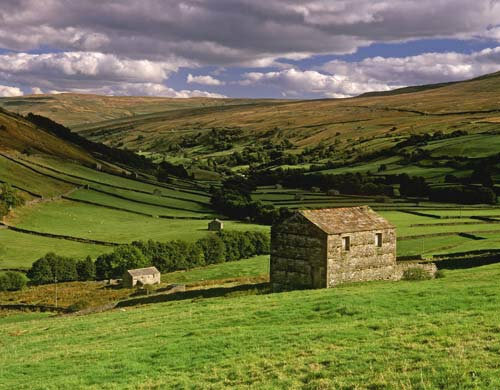 These drystone wall edged fields are reminiscent of the Yorkshire Dales. The stepping stones across the river in Dovedale…..
..the autumn colours near the riverside. And a deliberately impressionistic take on the trees reflected in the water. Daughter Ellie’s London Marathon training is on target: just as well, because the race is now only just over a month away. She thought a useful test would be to run the Wilmslow Half Marathon along in the next county. Malcolm and I were pressed into service as childminders (for ‘childminders’, read ‘providers of lifts’) and dog walkers. As we drove over the Pennines to Bolton, the temperature dropped to -2.5 degrees, the windchill factor took it well below that, and the wind swirled something of a blizzard round the car. A drive in the snow. The race was still on though. Once we’d arrived in Bolton, we sat around the kitchen table carb-loading (otherwise known as eating cake) and planning strategy. We had a quiet evening, packing Ellie off to bed at 9 o’clock for her before-6.00 a.m.-start. But in the middle of the night, when Ellie checked on-line, the inevitable had happened. For safety reasons, the run had been cancelled. Brian takes Ellie for a walk. So no race, no excitement, no challenge. Ellie and I took Brian-the-dalmation for a long walk in the snow. And that, dear reader, was that. Very special and heartfelt thanks to those of you who have sponsored Ellie for running the London Marathon. Because of people like you, she has raised nearly 150% of her target. All the money raised will go towards research into osophageal cancer, a disease that is still little understood compared with better-resourced breast cancer. Thank you. Thank you. Even more Pennines near Skipton. 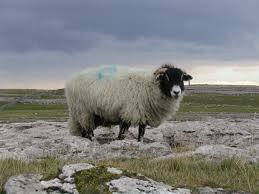 As you walk the fells, moors and dales of northern England, this is what you’ll see. Masham Moor from Slipstone Crags. Miles and miles of drystone wall. In the Yorkshire Dales alone, there are some 8000 km. of wall, compared with only 990 km. of hedgerow, and 250 km. of fencing. These walls keep flocks of sheep contained upon a single fell. 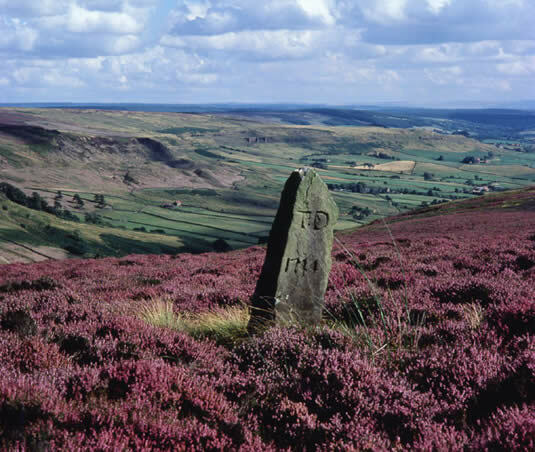 They provide a boundary between moorland heather and bracken, and more productive farmland. They divide one farmer’s plot into more manageable fields. Winter has arrived. It’s taken its time. We’ve been accustomed to mildness, and lots of mud. Suddenly though, sunrise has been that rich blazing orangey-red, with vibrant yellow, that seems to arrive only on very cold days. And Jack Frost has been amusing himself by designing complicated patterns on car windscreens, making sure they’re good and hard to scrape off by a would-be early driver. Last Friday, we travelled over the Pennines to Bolton. The hills were, for the first time this year, covered with snow. We even had the mini-adventure of battling through a mini-blizzard. And the next day, we travelled back. Cars slithering and careering wildly, or worse, along icy roads, closed our usual road home: instead we diverted across bleak moorland via Todmorden, Mytholmroyd, Hebden Bridge, Howarth and Keighley – a real Wuthering Heights landscape, meeting only very hardy sheep for much of the way. These were the views. Author margaret21Posted on December 14, 2014 December 14, 2014 Categories YorkshireTags Pennines, winter10 Comments on In the bleak midwinter…. This way for the alternative route for caravans. Last year, 74 HGVs marooned themselves on the slopes… and so on, and so on. 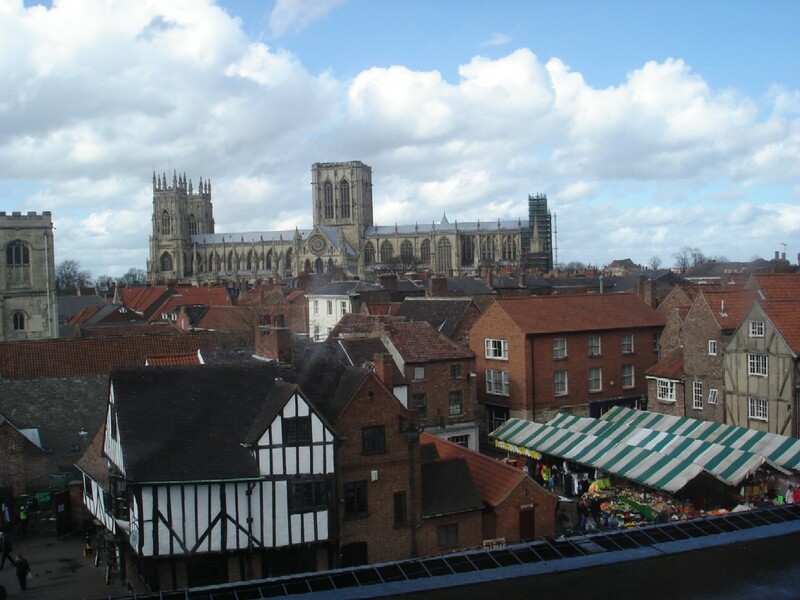 Certainly, it is a dizzying climb, with the patchwork fields of the Vale of York laid out far below. Then suddenly, you’re at the top. You’d have to be in a real hurry not to park and get out for a while to enjoy the view, as we did twice today, once on the way out, and once on the way back. It’s winter now – not long to the shortest day – so these sunset scenes were taken at just after 3.00 p.m., a mere three hours after we’d climbed upwards, only shortly before midday. Eeh bah gum, it were grand. One of the views from our walk last Thursday. In the distance, the ruined castle of Lagarde. In the far distance, the Pyrenees. It’s come at last. The week we move back to Yorkshire. On Saturday we did ‘The Long Goodbye VI’. This time next week, we’ll have been back in England almost three days. So that’s it for ‘Life in Laroque’. Maybe one more post. Maybe not. So what do I do about it? Shut up shop and start again? Or simply change the title and keep writing? I don’t know how things will change for me once I get back to Yorkshire. I’m fairly sure I’ll want to keep on writing a blog. I’ve enjoyed the discipline of getting memories recorded. I’ve loved having feedback from friends. At first, these friends were people I’ve shared part of my life with, people I’ve worked with or spent time with socially. Increasingly, they’re cyber-friends: people who take the trouble to comment, criticise, offer suggestions and memories of their own, and whose blogs interest me. Yesterday, though, Malcolm made a suggestion, remembering the exhibition I’d had a hand in organising here, comparing the Ariège with Yorkshire. Why not change the title of my blog to ‘From the Pyrenees to the Pennines’? That’s what we’re going to be doing after all : exchanging one set of hills for another. For quite a while, having been away so long, I expect to be something of a foreigner in my own country, and this might be reflected in what I choose to write about. Or not. I just don’t know. I’m sure I’ll lose some of you, dear readers. Perhaps your interest is in France, specifically this part of France. But I’d love it if some of you choose to continue the journey with me, as we settle back to life in the UK and travel further afield from time to time. We’re bound to come back to the Ariège too. There are favourite people to see, favourite places to visit, and new places still to discover. So ……. new blog? Continue with this blog under a new name? What do you think? I’d love to hear from you, especially if you’re one of those bloggers with whom I have cyber-conversations. Thanks for coming with me this far. I’ve enjoyed your company. The Yorkshire Dales. They’re not bad either, are they? Author margaret21Posted on March 17, 2014 Categories Ariège, England, France, Laroque d'Olmes, Pyrénées, YorkshireTags Ariège, England, Laroque d'Olmes, Pennines, Pyrénées, Yorkshire29 Comments on What to do next? Today, three friends from Lavelanet are coming to stay in Ripon (with friends of ours: we can’t cram them into our tiny flat). They’re members of Découverte Terres Lointaines coming to Discover Yorkshire in Six Days. Over the next few months, you’ll find out why. But Yorkshire in 6 days? That’s quite a challenge isn’t it? Especially as it would be good to show something of what the Ariège and Yorkshire have in common: dairy and sheep farming, a textile industry long past its glory days, mining and quarrying ditto, a religious past coloured by conflict…. If you were Tour Guide, what would YOU choose? The Dales? Swaledale, Wharfedale, Nidderdale….etc. Which is your favourite? 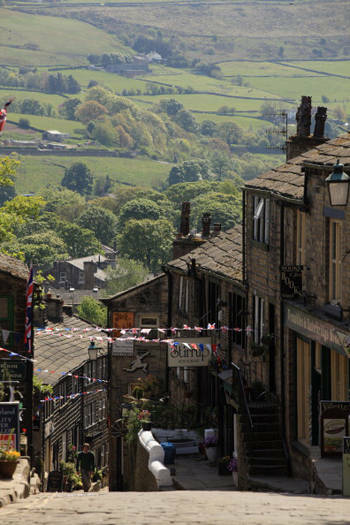 Hawarth: A chance to see a bit of the wonderfully bleak landscape, and visit the home of the Brontë family. 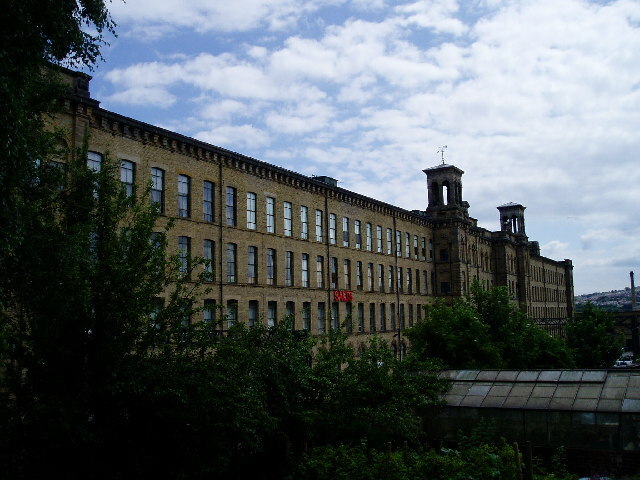 Saltaire: a model village built by philanthropist Titus Salt in the 19thcentury as a decent place for workers to live. 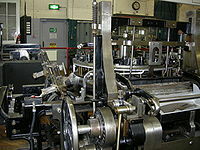 Philanthropists like Salt built others in the UK – such as Port Sunlight on the Wirral and New Earswick inYork. 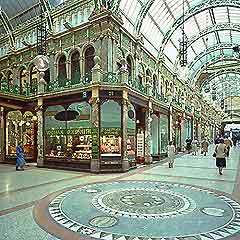 Leeds: the city centre – a mix of Victorian civic pride and modern business district. 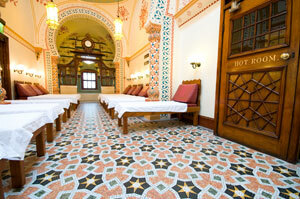 Harrogate Turkish Baths: time for us to relax and re-charge our batteries. 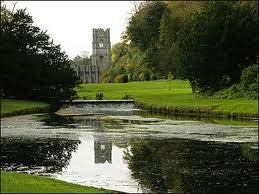 Fountains Abbey: this Cistercian monastery is, like Saltaire, a World Heritage site. And a beautiful and peaceful place. We’ll need to include a pub, fish and chips, preferably eaten on the seafront out of soggy paper. Curry too. But why is the totally inauthentic chicken tikka masala apparently now our national dish? I’m so looking forward to being a tourist in my own birth county. I hope our friends enjoy it too.